Penny Weber draws Ava hopping up and down — with her pig tails flapping behind her — so you can really feel the story without a lot of extra words. Ava argues with her parents, and there’s a wonderful two-page spread that shows all her emotions with just drawings and sound effects. Ava’s running upstairs to her room — “Stomp! Stomp! Stomp!” — and kicking her toy car. (“Crash!”) Then the car falls to pieces, and Ava hangs her head into her hands…. There’s colorful backgrounds for some of the drawings, while others appear over a nice abstract expanse of white. This book has a clean simplicity that may be especially appealing to children and beginning readers. There’s three drawings that show Ava lying in funny positions in her room — and then, smiling, she seems to have gotten an idea. There’s four more wordless pages that follow Ava through her weekend, all the way through Sunday. 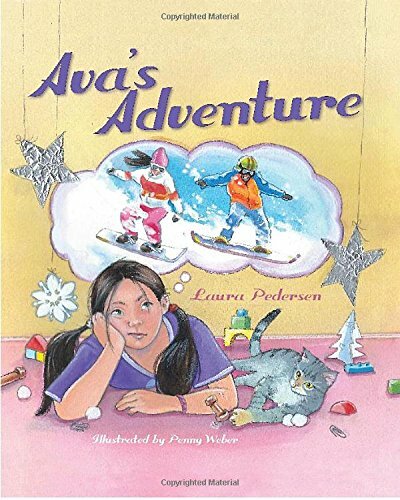 But finally, from the bottom of the staircase, Ava’s mother announces “You have a visitor.” Ava’s friend Lucas has come home early from his snowboarding weekend. And he discovers that Ava’s built an elaborate model of a ski resort out of things from around her house. The book ends with this proud testimonial to the joys of imagination. And its quiet, realistic drawings just make the story that much more effective. A marvellous, imaginative book … beautifully illustrated !